THE PEARLS were an R&B vocal group that formed at Tacoma's McChord Air Force Base in March, 1957. Artis Johnson Jr. -- an alumni of Oakland, CA's Midnights -- recruited three other singers (Elsie Hall, Lloyd Foster, & William Watson) & they competed in the military's annual Tops-N-Blue talent contest. By the next year's show Johnson & Hall had added new members: Rueben Martin & Ronald Small, they took the prize, & ended up performing Hall's "My Love" on the Ed Sullivan Show which aired from New York City on August 31st. Back home, the Pearls began working weekends at Seattle's top R&B dancehall, the Birdland (2203 E. Madison Street), where they were backed by house-band, the Dave Lewis Combo. 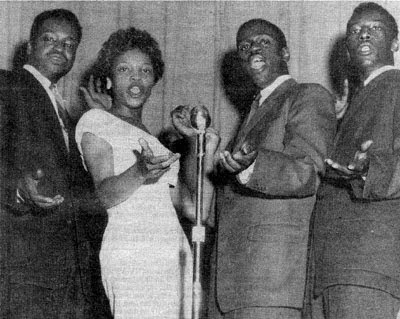 In February, 1959, the quartet left Seattle by car & drove to Los Angeles with hopes of getting discovered. Arriving at the offices of Walter "Dootsie" Williams' Dootone Records, they lucked into an immediate audition – & as the Los Angeles Sentinel noted on March 19th: "after hearing them sing just once he immediately signed them to a long term contract." 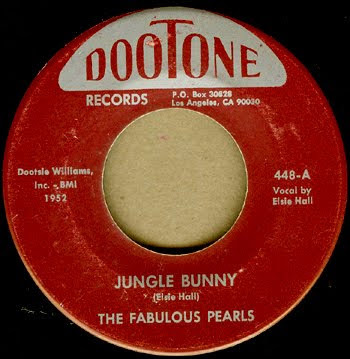 Ensconced in a recording studio with Ernie "Raunchy" Freeman's ace band – Williams was ecstatic about his Fabulous Pearls, declaring that "Both sides of this record will explode." Well, not quite: even though the newspaper figured that the single's A-side ("Jungle Bunny") was an innocent "Easter-timed" (!) single, its title was actually based on some racist graffiti that Hall had once seen as a little girl. Williams thought it had "a slight edge due to its unusual style," but its edginess caused it to flop – so he began promoting the B-side, "My Heart's Desire," without much more luck. Three additional tunes -- "She'll Understand," "Baby Drop Top" & "I Laughed So Hard" -- were also cut, the latter finally surfacing on compilation CDs in 1995. 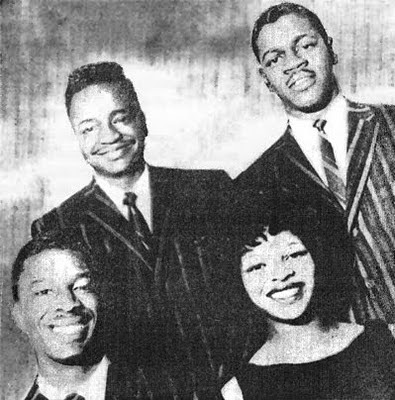 Back in Seattle -- & now recast as the Four Pearls -- they were signed in July, 1960, by Bob Reisdorff to his Dolton Records label which was scoring hits with Northwest acts like the Fleetwoods, Ventures & Frantics. The beautiful "Look At Me" (with Dave Lewis on piano) & "It's Almost Tomorrow" (with the Frantics) were cut by audio engineer, Kearney Barton, at his Northwest Recorders studio (622 Union Street). 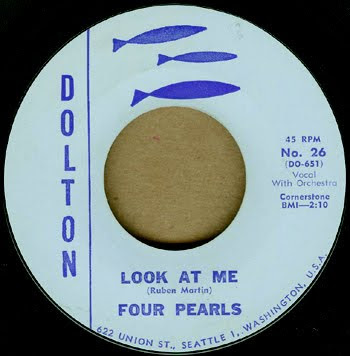 When issued by Dolton around August, KOL & various other Northwest radio stations gave "Look At Me" some support, but it failed to grow into a broader hit & the Four Pearls headed to Canada where they played their final gigs.